The Somme was the stage of a horrifying battle from the beginning of the summer of 1916. The deadly combat led to a tremendous number of human casualties. On July 1st 1916, the first day of the battle, out of the 120,000 British soldiers in action, almost half were wounded and 19,000 were killed. On the same day, 70% of the Soldiers from Newfoundland lost their lives. This War has been somewhat forgotten in Picardy but the vast number of cemeteries, memorials and monuments in the region are ever present to always remind us of the magnitude of the slaughter. 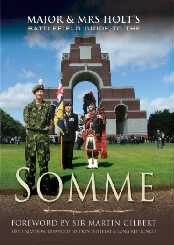 In July 2005, 89 years later, The Somme Remembrance Association was formed to help, ensure that the sacrifice of the men, the soldiers who came to fight and for thousands even to die, may never be forgotten. Besides placing importance on commemorating, the association will also strive to perpetuate the remembrance of the sacrifice of the Soldiers of the Great War. For this reason, the association will collaborate with the different local, national and international associations as well as public authorities and individuals who endeavour to do the same. -Coordinate or create special events for commemoration ceremonies. -Undertake or support public or individual actions related to the remembrance of the Great War and the Battle of the Somme. -Develop exchanges at national and international level to be used to historical, cultural and pedagogical ends. En juin 2005, un ami britannique m'a fait découvrir les cimetières militaires N°1 et N°2 de Serre. Puis nous nous sommes rendus quelques mètres plus loin dans le petit cimetière de Railway Hollow, prés du mémorial des "Accrington Pals".En regardant les pierres tombales, je me suis longuement arrêté devant celle du soldat A.Goodlad du régiment de York et Lancaster, il y était écrit :"The French are a grand nation worth fighting for ". J'ai été profondément touché par ce message et depuis ce jour, mon souhait de ne jamais oublier le sacrifice de ces hommes grandit en moi chaque jour. In June 2005, I visited Serre N° 1 and N°2 Cemeteries and a friend from the UK took me to see Railway Hollow Cemetery located further up the hill and close to the Accrington Pals memorial. 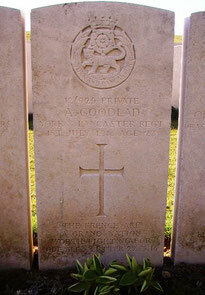 As I was looking at graves, I stopped quite a long time in front of the grave stone of Private A Goodlad from York and Lancaster regiment. I felt strongly moved by his message, and since then my desire that the sacrifice of these men never be forgotten has grown each day.